Highly reproducible fabrication of porous layer open tubular (PLOT) structures in fused silica capillaries is often challenging; thus, methods to measure layer thickness growth in real time represent a powerful tool for the production of such columns. 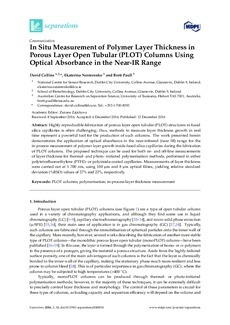 The work presented herein demonstrates the application of optical absorbance in the near-infrared (near IR) range for the in-process measurement of polymer layer growth inside fused silica capillaries during the fabrication of PLOT columns. The proposed technique can be used for both on- and off-line measurements of layer thickness for thermal- and photo- initiated polymerisation methods, performed in either polytetrafluoroethylene (PTFE)- or polyimide-coated capillaries. Measurements of layer thickness were carried out at λ 700 nm, using 100 μm and 8 μm optical fibres, yielding relative standard deviation (%RSD) values of 27% and 22%, respectively.